This is the video showing you how I carved an apple into a edible duck fruit carving! Let me know what you think! This is a photo of a recent fruit carving I did while video taping so that I can show you how to make a edible arrangement duck from carving an apple. I will edit the video and get it up soon! 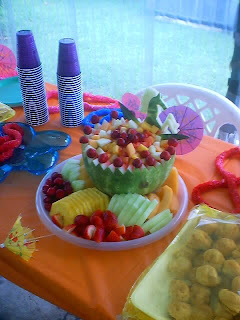 This is a watermelon fruit bowl I did for a party that has a stallion carving.